TEN POINTS IN KATA UNSU: By Sensei Mikio Yahara. KATA? ART FOR HEART’S SAKE. By Adrian Arsinevici. HIROKAZU KANAZAWA NO BO KATA. By Seamus O’Dowd. OBSERVATIONS AND REFLECTION. Brian Gonsalves. STANDING ON YOUR OWN TWO FEET. By Mike Clarke. SHOTOKAN: BEST OF BOTH WORLD’S.By Scott Langley. KIME: TRADEMARK OF SHOTOKAN KARATE. By Kousaku Yokota. 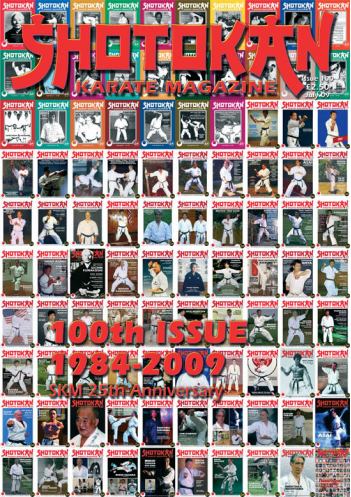 Welcome to the 100th edition of SHOTOKAN KARATE MAGAZINE. For me it’s been a labour of love for twenty five years and I hope that this comes across through the pages of the magazine. I want to sincerely thank all the thousands of loyal subscribers from all over the world, many of whom have been with me for the whole ride. There are in fact quite a few karateka who have subscribed from issue No. 1. I want to thank all the equally loyal advertisers. And very importantly all the contributors over the years, e.g. Mike Clarke, Avi Rokah, Tim Hanlon, Scott Langley, Dave Hooper, Aaron Hoopes, Richard Amos, Bill Laich and many, many more, far too many to mention here. I also want to thank the two other members of the SKM ‘team’, Clare Worth 3rd Dan, SKM secretary, who does all the administration, advertising, subscriptions and a million other things and has done for the past 17 years. And Graeme Armitage 3rd Dan, SKM webmaster and graphic designer who deals with all things cyber/technical/digital etc., plus designing 90% of all the adverts that appear in SKM. Graeme has been with SKM since issue No.2 (Feb 1985) and has trained with me since 1983. Clare has trained in Shotokan with me since 1992, so we have all taken the journey – both Shotokan karate-do and SKM together for many, many happy years. My job as editor is to decide on the content and material for the magazine and find a balance of articles and subjects with which to maintain the standard everyone has become accustomed to. Hopefully I’m getting it right. The main thing that has kept me going with SKM for 25 years is the fact that I am a practicing Shotokan karateka as are Clare and Graeme and we still train, week in week out, rain or shine. Hopefully this has given me the insight to understand what the readers want to read and I have intended the magazine to have a ‘hands-on’ approach but also to maintain the spirit of Traditional Karate-do, which means continually featuring articles of a philosophical nature and not only technical material. I hope you feel that this is a ‘special’ edition although many people have said to me, and I quote .... “Every issue of SKM is ‘special’.” However, I think the UNSU article by the amazingly talented Mikio Yahara sensei, is something ‘SPECIAL’. I hope you like this all ‘colour’ edition. Don’t get use to it though, this luxury is just for this special 25th anniversary 100th issue. 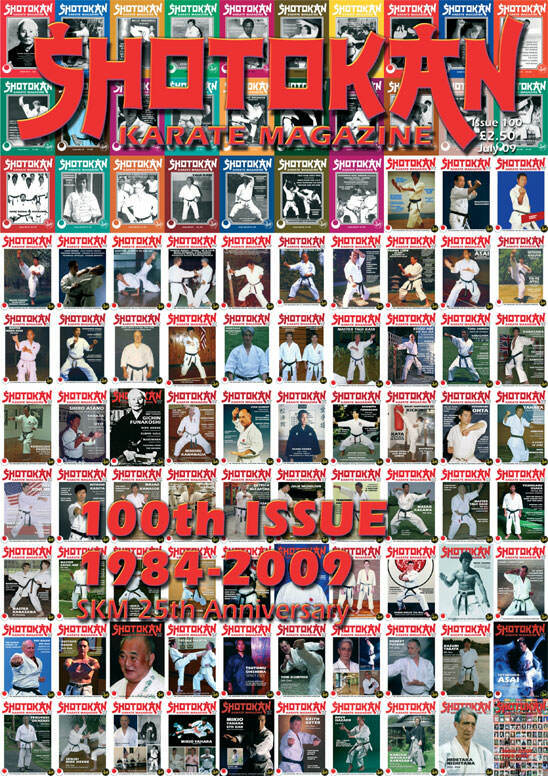 FRONT COVER: Showing the full 100 issues of SKM from 1984 right up to this 100th edition in 2009. We (SKM) are very proud as a non-commercial, subscription based publication, to have been able to publish the magazine every three months (quarterly) on time, without fail throughout the 25 years of its existence. Hopefully with your support we will continue for many more years to come to produce this non-political magazine dedicated to Traditional Shotokan Karate-Do. KIME: TRADEMARK OF SHOTOKAN. By Kousaku Yokota. Author, Sensei Kousaku Yokota 6th Dan JKS, based in Mountain View, California, USA. The readers will agree that perfect kime is what we dream of when we do the oi zuki or gyaku zuki. Bang boom! Look at Enoeda sensei’s zuki. Yes, this is Shotokan. I am aware of the graveness and controversial nature of my statement. However, I am convinced that all instructors and serious practitioners must be aware of and understand well this prevalent problem in Shotokan training. Despite the risk of being misunderstood, I dare to write this article as I believe this knowledge must be expressed publicly. So, please read on to catch the true essence of my statement. Keinosuke Enoeda’s masterful gyaku zuki. I want to emphatically state that I am NOT identifying kime itself or having a correct kime in your techniques as a problem. If you are capable of producing a good and correct kime and you feel your overall movements are fluid, then this may not be an issue. What I wish to convey is that the overly tensed body that kime creates is the problem. But… isn’t kime a tensed body? We remember some instructors explaining kime by saying, “In order to make kime, your entire body must be tensed like a bronze statue like this” and he/she would demonstrate kime with a tensed arm and clenched fist extended in front in a very low zenkutsu dachi. His/her face would be distorted with tightly clenched teeth and you could see the muscles around the neck all popped out as they are all TENSED. Indeed, those instructors are successful and many Shotokan practitioners do look like bronze statues. Haven’t we heard or read the criticism by other styles (particularly kung fu practitioners who love to categorize,) that we are “stiff”? We may just ignore them or their comments saying, “they don’t know the real power of Shotokan.” But can we really ignore their criticism when Shotokan is producing many “stiff” or rigid looking practitioners? We could comfort ourselves by saying, “Let them say it. If we could get on the floor, we could knock them down flat on their faces with one punch”. But wait just a second; as long as Shotokan practitioners fight in non-contact competitions, no one would ever know for sure if your mighty punch would knock down your opponent. Or would you want to challenge them to a full contact, knock down match? Let’s look at what “stiff” means in a dictionary. By Define.com, “stiff” means “lacking ease in bending, not limber. Not moving or operating freely.” Within the definitions on that website, it includes the meaning of stiff as “powerful”, with examples such as “a stiff current” and “a stiff breeze.” So, if one is stiff, his/her karate techniques can be powerful but may not be operating freely. Isn’t this interesting? I can see at least two serious and damaging problems associated with kime. To get maximum tension (kime), the most important thing to do is that one must first relax. The degree of tension correlates to that of the delta between tension and relaxation. In other words, the larger the gap between non-tension (or being relaxed) and tension, the sharper the kime one can achieve. For the sake of argument, let’s say that two practitioners will have the end results of 100% tension. While one started from relaxed muscles at 20% tension and then achieved the kime degree of 80, the other started from rather tensed muscles at 60% then achieved only 40 kime degrees or half that of the first person. This dull tension (though it may be 100% kime at the end) will result in a push punch for the second practitioner rather than a sharp and a snappy punch he wished he had. Now, all instructors and senior practitioners know this. However, beginners do not know how to control their muscles in a defined and intricate manner to balance relaxation and tension. So naturally they tighten up all the muscles (total stiffness). We have witnessed this every time we see a white belt who moves like a robot. This is all natural and expected. Remember when you learned how to drive for the first time? Do you remember how stiff your arms were as your hands were tightly wrapped around the steering wheel? How about now, after years of driving? You must be driving with one hand on the steering wheel relaxed and the other hand may be doing other things such as holding a cup of tea, a mobile phone, etc (which I do not recommend at all.) Naturally you want to develop into this (relaxed arms) as you find that you can actually drive better (or operate freely.) If you were a driving instructor you would never say to a first time driving student “Tighten your arms to get the maximum strength to turn your wheel.” You would say, “Bring your shoulders down and relax your arms.” Of course, the ultimate purposes are different between karate techniques and driving skills. You are not trying to get kime in your driving, however, the fundamental concept of body or muscles control is still the mutual objective. By achieving fine muscle control, a practitioner can graduate from the digital and robot like moves to the higher level of fluid body movements. I want to strongly advise all instructors to tell their students to relax as much as possible before making any body movements, including their legs. You may object to the idea of relaxing the legs as we must always have strong stances. This is an interesting subject to discuss but we will skip it here as we are covering the general concept of relaxation and tension for kime. Premature kime resulting in a pushing punch is not the only problem. This condition will also considerably slow you down. Let’s go back to the driving analogy. A pushing punch is the same as pressing on the brakes while stepping on the accelerator at the same time. I am sure you have seen an automobile in front of you with its brake lights continuously on even though it is still moving forwards. Yes, that driver is stepping on the brakes and the accelerator at the same time. Although in driving this action may be acceptable, it is not considered safe driving. In karate we do not want to have a slow technique (half going and half stopping). You want to have quick impact like a rocket slamming into a target. Have you ever heard of a rocket with a braking mechanism? Of course not. If that is the case why do we need kime or braking in karate? Why can’t we shoot our fist like a bullet and slam it into the target? Well, a bullet is made of metal and can penetrate a solid target, whereas our fist is too soft and light so it would not cause damaging impact when it is completely relaxed. Just imagine what would happen to your fist if you hit a makiwara in that condition. This is why you need to tense your fist but not throw it like a bullet either. We need to use our body to drive the fist in (more like an explosive device in a rocket). Even if you only squeeze your fingers, this action will naturally tense the forearm muscles and will work as a brake and slow down your punch. So, if your whole arm or the entire body is tensed, then the braking action that is created will be huge. This is why kime must not last longer than one tenth, or even better, one hundredth of a second. Kime can be compared to the cutting edge of a sword; the sharper the edge, the better a sword can cut. In karate a shorter tension results in a sharper technique. When kime is too long (say one second or longer,) your technique is no longer a sword but a wooden stick. A stick or a baseball bat can still hurt when you swing it but it cannot cut. Then why wouldn’t instructors just say, “Kime for one hundredth (one tenth) of a second?” It is because a long tension has the visual effect and faulty look of good kime. It is like flexing one’s upper arm muscles and showing off the large biceps even though that itself has no proof of power or strength. Making proper kime is indeed a technique itself. Yes, it is a technique (actually a high level one) just to be able to control your body in such a manner whether it is done with or without a karate technique in mind. Many instructors may object to my earlier statement by saying, “I tell the beginners to relax.” They may be doing that, but that alone is not enough. What they need to do is to go further and help their students to achieve sufficient relaxation (or decrease their tension to the minimum level). The beginners may say they are relaxed, but actually they are still very tense without knowing it. The important job for any instructor is to bring down the tension level before the training starts and try to keep it down during the entire training session. This really is challenging for the instructors as they could get a false sense of satisfaction from “hard” training where all students sweat and pant. However, the most important thing for students to do in class is to learn the techniques and how to improve them. If they want to sweat and simply get tired, they can always go to a gym and lift lots of weights. We must be honest and challenge ourselves to teach in environments where students can learn. I must note that one factor that permits and actually encourages “long kime” is the popularity of tournament competition (both kata and kumite). I defer from explaining the details. I consider it unnecessary as I believe most readers must already know the relationship between shiai and long kime. Accordingly, several known masters had noticed the difficulty of relaxation and had made some changes in their teaching and training. I would like to go over what the following three masters have tried and done: they are Egami, Kanazawa, and Asai. Sensei Egami based his style on relaxation. The last sentence is right on target. In order to develop perfect kime, he believed that one must emphasize on relaxation. “Focusing all the energy on one point” indicates the process of making a fist into a bullet that would penetrate the opponent. According to the website of Nihon Karatedo Shotokai of Japan (http://www.shotokai.jp/japanese/about/teacher_egami.html), Egami started to change his training after the death of Master Funakoshi. It points out that he searched for the “ultimate punch with maximum penetration power.” If that was what he wanted to achieve, it was very natural that he came to realize that total relaxation is the key. Shotokai seems to be a very exclusive organization and they do not believe in tournaments. They tend to stay away from cooperating with the other organizations of Shotokan (at least in Japan and the US). One interesting development from the search for total relaxation in karate by Egami is the birth of a new martial art, Shintai-do. It was founded by one of Egami’s students: Aoki. I do not have the space to explain what Shintai-do is in detail here. I can only say that its techniques have much more circular body motions and relaxed movements like Shotokai. I suggest that interested readers do some research on the techniques of not only Shotokai but also of Shintai-do to broaden their knowledge and perspective. Kanazawa sensei combines Tai chi and karate. Kanazawa was a rising JKA star in the 60’s and 70’s but he left the JKA in 1978. He and his organization, Shotokan Karate-do International Federation (SKIF), surprisingly, are better known outside of Japan. It is well known that he practices Tai Chi and Aiki-do to supplement his training. Even though there are several different training styles in Tai Chi (formerly Tai Chi chuan), the best known training is the slow motion routines that groups of people practice together in parks in China. It is considered a soft style martial art, an art applied with internal power. Obviously he complimented the “hard” style martial art of Shotokan with this soft style martial art to supplement his training to achieve the fluid motions. He also picked Aiki-do obviously to learn a martial art that focuses on throwing techniques. Aiki-do and Judo have the same forefather, Jujitsu, but it is natural that he chose Aiki-do and not Judo as it has the similar ma-ai (whereas that of Judo is a grappling distance). The Aiki-do techniques do not depend on muscle power but rather on off-balancing techniques with similar ma-ai (distance) of karate. As I have taken only a few seminars of Kanazawa’s and do not have personal contact with him or his organization, the statements about him and his training are only my guesses. It is very unfortunate that Asai passed away in 2006, but he left a big impression and influence on all Shotokan as well as other traditional karate practitioners. He was known for his flexible and limber body as well as his whip-like techniques. I am lucky to have received some personal instruction from this world famous instructor. Asai took up a Chinese style as Kanazawa did, but he picked a hard style that focuses on external power, namely Hakutsuru ken (White Crane style), when he went to Taiwan in the 60’s. He met his wife and her older brother there. Asai’s brother-in-law is a master of this style and is still alive in his 80’s. Mrs. Asai told me many interesting stories about the training and technique exchanges between these two masters from two different styles. Asai was a flexible person to start, but from White Crane kung fu he further learned how to use his arms and legs like a whip. To do this he learned that his upper body must be totally relaxed to throw an arm for a strike or the muscles of a leg for a kick. He also learned to separately control his muscles as finely as possible to gain the dexterity of the different parts of his body. Asai travelled to Europe extensively so I am sure many of the JKS practitioners in that region have witnessed the following feats. Tetsuhiko Asai studied White Crane Kung Fu along with Shotokan karate-do. He had such control of the muscles around his shoulders he could move his shoulder so quickly to give an impact just like a straight punch. For him, a one-inch punch was an easy task. He said that the ultimate is the zero-inch punch with your arm totally straight and a fist touching the target. If he could punch with his shoulder all he had to do was to transfer the power to the extended arm. He also showed the same power from his hips. He could knock you down by his hip whip when you try to restrain him by a hugging motion. It is obvious that in order to do these feats, one’s body must not be tensed. Even in his late years he spent a minimum of 2 hours every morning to stretch and go through the complex exercises to relax his muscles. You can see some of the unique exercises in the JKS video (VHS) in which Asai himself performs many kata and bunkai, including those of JKA and Hakutsuruken/White Crane Kung Fu. As instructors of the 21st century, we are now obligated to have a better understanding of physiology and kinesiology. Let us recognize the importance of a relaxed body and put more focus on getting our body prepared for learning rather than on tension or making power. Tension is a big obstacle to beginners and students who are trying to learn techniques. In the end, more relaxation will result in better kime, with the additional side benefits of better body control and fluidity of body movements. By achieving this, we can proudly invite the kung fu practitioners to our training and impress them not only with our powerful kime but also by our fluid movements just as Asai sensei and Kanazawa sensei did to the Chinese martial arts practitioners. (JKS and SKIF both have dojos in Taiwan and mainland China).